ALLA REDDY INSTITUTE OF MANAGEMENT conducting workshops / seminars / conferences which are instant result-based training programes, geared to the needs of students who wish to acquire new skills (or) renew their competencies. Workshops / Seminars are offered in a variety of disciplines and are facilitated by faculty that are well recognized in their field. 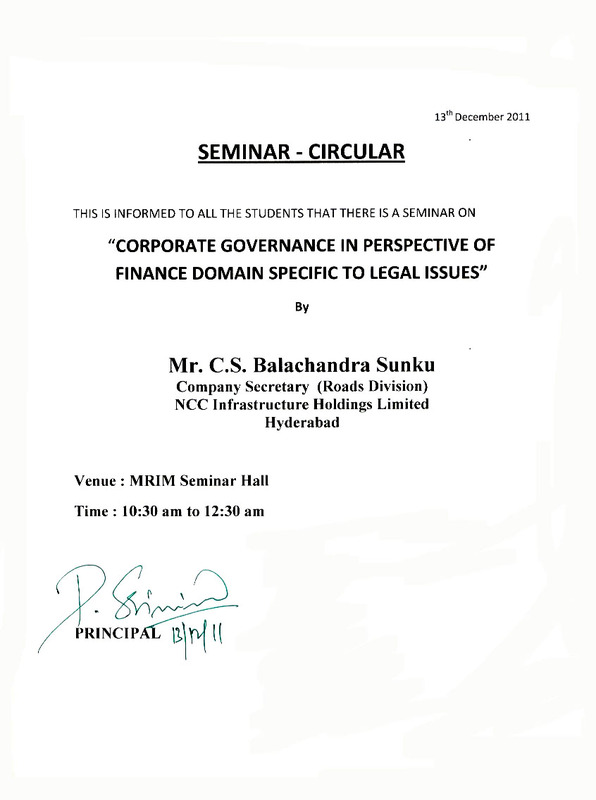 Seminar on "Subjective information - How to consulitate for better career"
Seminar on "NCFM certification & its Importance for finance students"
Seminar on "IDENTIFYING COMPETANCIES - MAXIMISING FOR CAREER GROWTH"
Seminar on "career opportunities in banking & financial institutions"
Seminar on "Lean Six Sigma Green Belt course On 03-12-2013"
Seminar on "Basics of Stock Market & Art of Investing On 26-11-2013"
Seminar on "Primary Markets & Financial Analysis of documents On 07-11-2013"
Seminar on "Awareness on Indian stock market On 09-10-2013"
Seminar on "ANTI RAGGING SEMINAR"
Seminar on "OPPURTUNITIES TO MBA'S IN INDIAN STOCK MARKET"
Seminar on "Enterpreneurship Orientation Programme On 06-12-2012"
Seminar on "Importance of Communication skills Etiquettes & Interview tips On 12-12-2012"
Seminar on "CHAMPION THE CHANGE On 23-01-2013"
Seminar on "INTERVIEW SKILLS On 21-02-2013"
Seminar on "HOW TO IMPROVE INTERVIEW SKILLS On 13-03-2013"
Seminar on "ENTREPRENEURSHIP ORIENTATION PROGRAMME"
Seminar on "PERSPECTIVES ON VALUES AND VALUATION"